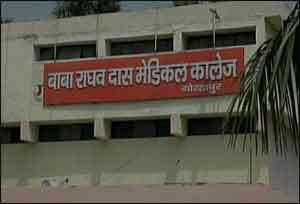 Gorakhpur: The proprietor of Pushpa Sales, which supplied oxygen to the state-run Baba Raghav Das Medical College where dozens of children died last month, was on Sunday arrested in connection with the case. More than 60 children, mostly infants, had died at the hospital within a week last month.There were allegations that the deaths occurred due to a disruption in oxygen supply over unpaid bills to the vendor. The state government had vehemently denied that shortage of oxygen led to the deaths. With the fresh arrest, all the nine persons named in the FIR have been sent to custody. “Manish Bhandari, the proprietor of Pushpa Sales was arrested by the Gorakhpur Police at around 8 am from Deoria bypass road,” Senior Superintendent of Police, Gorakhpur, Anirudh Sidhartha Pankaj told PTI. The SSP said Bhandari’s medical examination is being conducted and subsequently, he will be interrogated. “Later he will be produced in a local court,” he said. According to police sources, Bhandari was absconding for a long time. On 15 September, the anti-corruption court had declared Bhandari an an absconder, and issued orders to attach his properties. Pushpa Sales was the former oxygen supplier to the medical college. In its report submitted on 23 August, the committee under Uttar Pradesh chief secretary Rajive Kumar probing the hospital tragedy had recommended initiating criminal action against then principal of the BRD Medical College Dr Rajiv Mishra, Head of Department of Anaesthesia Paediatric Dr Satish, in-charge of 100-bed AES ward Dr Kafeel Khan and Pushpa Sales. Uttar Pradesh chief minister Yogi Adityanath had constituted the committee under the chief secretary on 12 August, a day after deaths of scores of children in the state-run hospital.